They are eukaryotes because they all have a nucleus. Most have mitochondria although some have later lost theirs (Link). Mitochondria were derived from aerobic alpha-proteobacteria that once lived within their cells. Many have chloroplasts with which they carry on photosynthesis. Chloroplasts were derived from photosynthetic cyanobacteria living within their cells. Link to a discussion of the "endosymbiosis"
theory of the origin of eukaryotes. Many are unicellular and all groups (with one exception) contain some unicellular members. The name Protista means "the very first", and some of the 80-odd groups of organisms that we classify as protists may well have had long, independent evolutionary histories stretching as far back as 2 billion years. But genome analysis added to other criteria show that others are derived from more complex ancestors; that is, are not "primitive" at all. Genome analysis also shows that many of the groups placed in the Protista are not at all closely related to one another; that is, the protists do not represent a single clade. a better title for this page would be "Eukaryotes that are neither Animals, Fungi, nor Plants". Many swim by means of a single flagellum. They are not encased in a cell wall so they are flexible as well as motile. Euglena is a typical member of the group (which numbers about 1600 species). Because some members of the group (like Euglena) have chloroplasts, these organisms used to be called "Euglenophytes", but in fact they are neither plants ("phytes") nor animals ("zoa"). Rather — like the other organisms on this page — they are the living descendants of some of the very earliest eukaryotes. Trypanosoma brucei, the cause of African sleeping sickness in humans, is a member of the group. The electron micrograph (by L. Tetley; courtesy of Keith Vickerman) shows T. brucei as it occurs in the salivary gland of the tsetse fly ready to be injected into the mammalian host when the fly bites. The specimen is 12 µm long. How trypanosomes evade the immune response of their host. In Latin America, Trypanosoma cruzi, another member of the group, is the cause of Chagas disease in humans. close homology in their gene sequences. Move by the rhythmic beating of their cilia. Examples: Paramecium, Stentor, Vorticella, Tetrahymena thermophila. Although single-celled, some are large enough to be seen with the naked eye. In fact, the tiny parasitic wasp Megaphragma mymaripenne, with its tens of thousands of cells (4,600 neurons alone), is no larger than Paramecium. Feed by sweeping a stream of particle-laden water through a "mouth" and "gullet" and into a food vacuole. Undigested wastes are discharged at a permanent site. Fresh water ciliates cope with the continuous influx of water from their hypotonic surroundings by pumping it out with one or more contractile vacuoles. Parasitic ciliates, which live in isotonic surroundings, have no contractile vacuole. All of this rightly suggests that although they are unicellular, there is nothing rudimentary about the ciliates. Their single cell is far more elaborate in its organization than any cell out of which multicellular organisms are made. Link to discussion of reproduction in the ciliates. The members of this group share an "apical complex" of microtubules at one end of the cell (hence the name that many prefer to the old name of sporozoans). All the members of the phylum are parasites. The genus Plasmodium causes malaria, one of the greatest scourges of humans. There are 4 species that infect humans of which Plasmodium falciparum is the most dangerous. Malaria has probably caused more human deaths than any other infectious disease; even today it is estimated to kill a million people a year in the sub-Saharan Africa. The organism is transmitted from human to human through the bite of mosquitoes of the genus Anopheles. The diagram shows the Plasmodium life cycle. The mosquito bite injects sporozoites into the human host. These invade the liver where they develop into merozoites. The merozoites invade red blood cells where they reproduce. Periodically, they all break out of the red cells together bringing on the chills and fever characteristic of the disease. Eventually some merozoites develop into either male or female gametocytes. These will die unless they are sucked up by the bite of an anopheline mosquito. Once in the stomach of the mosquito, the gametocytes form gametes: sperm and eggs. These fuse to form zygotes. The zygote invades the stomach wall of the mosquito forming thousands of sporozoites. These migrate to the salivary gland, ready to be injected into a new human host. Most forms of malaria are chronic. The organisms may coexist with their host for years (but cannot complete their life cycle there). How they evade the immune response of their host. Toxoplasma gondii is another parasitic member of this group. Plasmodium, Toxoplasma, and some of the other members of this group contain a membrane-enclosed organelle called the apicoplast. They seem to have inherited it from a common ancestor that acquired it by engulfing a chloroplast. Link to a discussion of this example of secondary endosymbiosis. They do have the eukaryotic type ("9 + 2") of flagellum (two of them in fact). Occasionally they reproduce explosively, creating poisonous red tides that may cause extensive kills of marine fish and make filter-feeding marine animals like clams unfit for human consumption. a yellow-brown pigment (which gives them their color). It is a carotenoid called fucoxanthin. Diatoms are unicellular. Their cell wall or shell is made of two overlapping halves. These are impregnated with silica and often beautifully ornamented. The photo (courtesy of Turtox) is of Arachnoidiscus ehrenbergi magnified some 400 times. 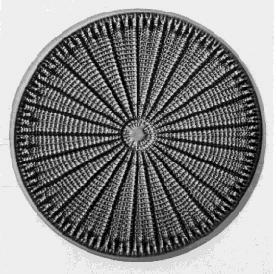 Diatoms are major producers in aquatic environments; that is, they are responsible for as much as 40% of the photosynthesis that occurs in fresh water and in the oceans. They serve as the main base of the food chains in these habitats, supplying calories to heterotrophic protists and small animals. These, in turn, feed larger animals. Important producers in some aquatic food chains. In low light conditions, may lose their chlorophyll and turn heterotrophic feeding on bacteria and/or diatoms. Over 1000 species alive today; many more in the fossil record. 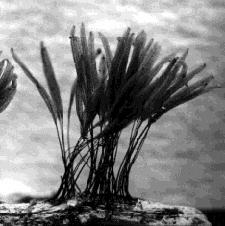 The rockweeds and kelps. Some kelps grow as long as 30 meters. All are multicellular although without much specialization of cell types. Most are found in salt water. Used for food in some coastal areas of the world and harvested in the U. S. for fertilizer and as a source of iodine. As their name suggests, water molds were once considered to be fungi. But unlike fungi, the cell wall of water molds is made of cellulose, not chitin. Furthermore, their gene sequences are very different from those of fungi (and most closely related to those of diatoms, golden and brown algae). Some species (e.g., Saprolegnia, Achyla) are parasites of fishes and can be a serious problem in fish hatcheries. Downy mildews damage grapes and other crops. Phytophthora infestans, the cause of the "late blight" of potatoes. In 1845 and again in 1846, it was responsible for the almost total destruction of the potato crop in Ireland. This led to the great Irish famine of 1845–1860. During this period, approximately 1 million people starved to death and many more emigrated to the New World. By the end of the period, death and emigration had reduced the population of Ireland from 9 million to 4 million. Phytophthora ramorum, which is currently killing several species of oaks in California. The red algae are almost exclusively marine. Some are unicellular but most are multicellular. Approximately 7000 species have been identified. They are photosynthetic using chlorophyll a. Their closest relatives are the green algae and land plants. They do not have the eukaryotic "9+2" flagellum. Some are used as food in coastal regions of Asia. Agar, the base for culturing bacteria and other microorganisms, is extracted from a red alga. The organisms in this group have a complex life cycle during the course of which they go through unicellular, multicellular, funguslike (form spores) and protozoanlike (amoeboid) stages. Thousands of individual amoebalike cells aggregate into a slimy mass — each cell retaining its identity (unlike plasmodial slime molds). The aggregating cells are attracted to each other by the cyclic AMP (cAMP) that they release. With the exception of one species that causes powdery scab on potatoes, these organisms are of little economic importance. However, their combination of traits makes them of great scientific interest. Molecular phylogenies place them in the same clade as animals (metazoa) and fungi. The link below will introduce you to one of the most popular members of the group. At one stage in their life cycle, these organisms consist of a spreading, slimy, multinucleate mass called a plasmodium that moves slowly over its substrate (e.g., a rotting log) engulfing food and growing as it does so. Eventually, the plasmodium develops stalks that produce and release spores. If the spores land in a suitable location, they germinate forming single cells that move by both flagella and pseudopodia. These fuse in pairs and start forming a new plasmodium. The left photo (courtesy of Prof. I. K. Ross) shows the plasmodial stage of Stemonitis just before it formed sporangia. The right photo (courtesy of Turtox) shows the fully developed sporangia of Stemonitis. Physarum polycephalum, another member of this group, is the subject of many laboratory studies. There are several groups of protists that were long thought to have no mitochondria. However, most (perhaps all) had them in the past. Today, only remnants of their ancestor's mitochondria — called mitosomes — remain. All are unicellular obligate intracellular parasites. Many are pathogenic in insects (one is even marketed commercially as a biocontrol agent). Some contaminate drinking water supplies and can cause gastrointestinal upsets in humans. Microsporidia, such as Encephalitozoon cuniculi, are a common cause of diarrhea in AIDS patients. Encephalitozoon cuniculi has a tiny genome with only 1,997 protein-encoding genes — fewer than many bacteria (e.g., E. coli has 4,290). Obliged to live within the cells of its host, it has lost the genes for many important functions (e.g., the citric acid cycle) depending instead on its host. Fungi are their closest relatives. Causes amebic dysentery, the third most common parasitic disease of humans (after malaria and schistosomiasis). Its closest relatives are the slime molds. These are single-celled (e.g., Monosiga), aquatic (both fresh water and marine) protists that have a single flagellum surrounded by a collar ("choano" = collar) of microvilli. 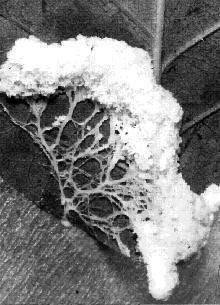 Some (e.g., Proterospongia) form simple colonies during part of their life. The flagellum is used for swimming and also beats bacteria-containing water through the collar for feeding. Sponges also use collar cells to filter food from the water. What functions these proteins have in the single-celled choanoflagellates remain to be discovered. The fungi are discussed in a page of their own. Link to it. Plants, including the green algae are described in a separate page. Link to it. A portal into the various groups of protists (and other eukaryotes) with many illustrations in color.